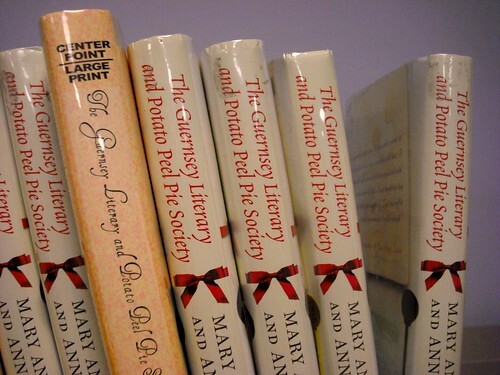 In book discussion a couple of weeks ago, we discussed one of my favorite books of the past year, The Guernsey Literary and Potato Peel Pie Society by Mary Ann Shaffer and Annie Barrows. There were 13 attendees, and 90% of them were in their seventies or older. Not only did we discuss the book, the characters we loved, the epistolary style of the book, but we also got to hear various "war stories" from the attendees, and discussed the accuracy of the book's portrayal of the Nazi occupation of the Channel Islands from World War II - no one who lived through that era had ever even heard of the occupation. It was just such a satisfying discussion - one of the best I can remember...maybe because it was more than just a shared love for a title, but because the attendees also gave a bit of themselves. If you haven't read this book, do. Then talk about it with your friends, neighbors, countryman...it's such a great read, and an even better discussion.